Team Penske and Hertz will debut a new livery on the No. 22 Ford Mustang driven by Joey Logano for the upcoming NASCAR Xfinity Series event at Darlington Raceway on Saturday. 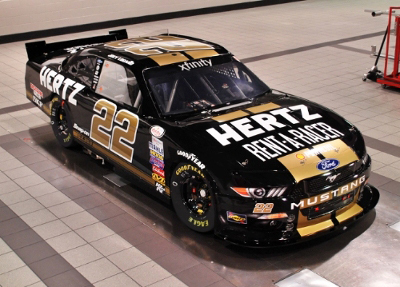 As part of the overall throwback weekend at Darlington Raceway, the car’s new paint scheme will be an ode to the famed Hertz / Shelby GT350H “Rent-A-Racer” program from the 1960s and will feature a black scheme with gold racing stripes. Nearly 50 years ago, Carroll Shelby and The Hertz Corp. devised a popular plan to help get select high-performance, special-edition Shelby Mustangs into the hands of rental customers who also happened to be car enthusiasts. 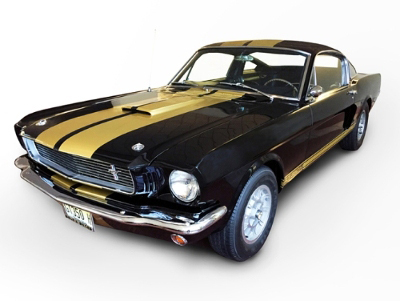 Mustangs are among the most sought-after collector cars in the world. Team Penske and Hertz have a successful history of collaborating on special paint schemes. In 2013, Logano drove a special-look No. 22 Mustang at New Hampshire Motor Speedway painted to mirror the limited-edition Hertz Penske GT that was debuted that same year and available from the Hertz Adrenaline Collection, similar to the “Rent-A-Racer” program. “I’m pretty excited to run this special Hertz paint scheme,” says Logano, a four-time NXS winner this season — his most recent coming at Watkins Glen International on Aug. 8 as part of a weekend sweep that also saw Logano win the NASCAR Sprint Cup Series race on Sunday. Darlington is celebrating its race weekend with a retro feel across the board – including a special pre-race concert, unique logos, throwback souvenirs and more. A number of teams in both the NASCAR Sprint Cup Series and NASCAR Xfinity Series will run throwback paint schemes throughout the weekend. Logano has earned 25-career NXS victories, including one at Darlington in 2012. In eight races this season, Logano has won four times and finished in the top-five on six occasions. He’s also earned four poles, giving him 30 in his career and moving him to second on the all-time NXS pole winners list. In addition to his success in the XFINITY Series this season, Logano has also earned three NSCS wins in 2015 and sits second in the point standings. The NASCAR XFINITY Series VFW Sport Clips Help A Hero 200 will be broadcast on NBC, with radio coverage on the Motor Racing Network and SiriusXM NASCAR Channel 90.